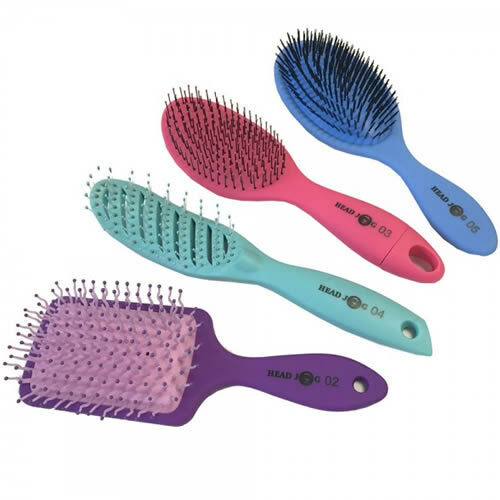 Great value eye-popping set of detangling and grooming brushes. 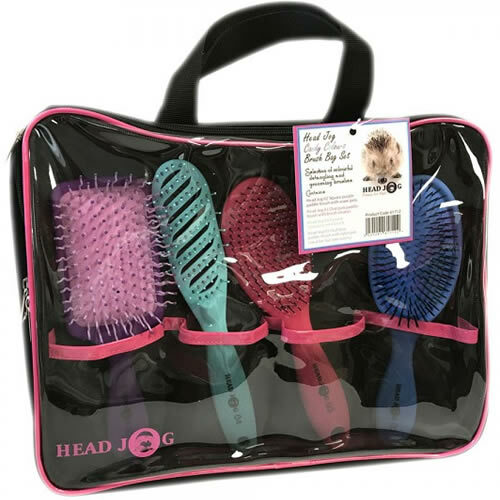 The Head Jog Candy Colours Brush Bag Set contains 4 different brushes to cover all kinds of brushing jobs. Head Jog 02—square purple paddle brush with wave pins. Head Jog 03—oval pink paddle brush with brush cleaner. Head Jog 04—curved turquoise vent brush. Head Jog 05—oval blue paddle brush with nylon pin: ideal for hair extensions. The clear carry bag has a hook for easy hanging and a central zip which opens to reveal two more compartments to store additional equipment. £18.00 (inc. VAT) Why no VAT? We're a trade wholesaler and quote our prices without VAT to help our VAT-registered customers understand the true cost of a purchase.